(A) Non credited abortive mission. For mission dates and targets see the missions list. 1Lt Howard G. Gravrock (P) - Mission 253 as CoPilot with a Combat Orientation Pilot. Five missions as a PFF Lead Crew Pilot (295A, 298A, 301, 310, 314). Other missions as a combat crew pilot. Combat tour completed on 10 March 1945. Became a Pastor at the Evangelical Lutheran Church, Red Wing, MN following WWII. 1Lt Benjamin Losiewicz (CP - Did not fly on ten Lt Gravrock missions where substitute CoPilot were used. (253, 254, 269, 287, 291, 293, 304, 329, 332, 333). Flew on one mission (254) as CoPilot with another Pilot. Upgraded from CoPilot to Pilot on 18 Dec 1944 for three missions (287, 288, 289). Flew three missions as a PFF Lead Crew CoPilot (312, 318, 334). Thirty-five mission combat tour completed on 28 March 1945. 1Lt Charles S. Klanian (N) - Flew on 30 missions with Lt Gravrock (All except 253, 281, 282, 291, 333 where substitute Navigators were used). Flew on five missions with other Pilots (253, 258, 288, 289, 290). Combat tour completed on 8 March 1945. 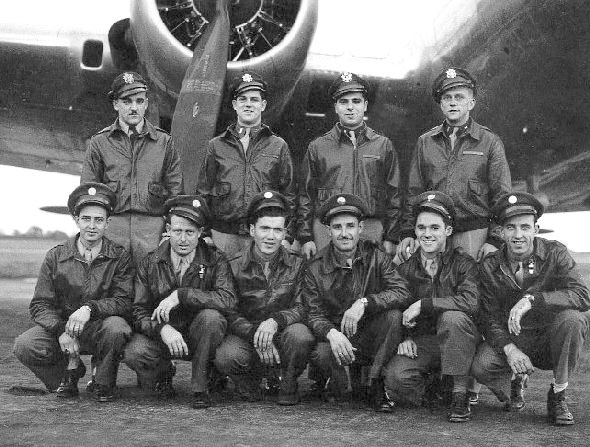 1Lt Francis G. Downey (B) - Flew on 16 missions with Lt Gravrock and 3 with other Pilots. Was made a PFF Lead Crew Bombardier for his final 13 missions. Combat tour completed on 17 April 1945. T/Sgt Raymond Levine (E) - Flew on 26 missions with Lt Gravrock. Killed in action on mission 335, 21 January 1945, 1Lt Richard D. Duffield Pilot. Only mission without Lt Gravrock as Pilot. T/Sgt George B. Engleman (R) - Flew on 32 missions with Lt Gravrock (All except 253, 291 & 304) plus 2 missions with other Pilots (337 & 340). Combat tour completed on 19 March 1945. S/Sgt Robert R. Relford (BTG) - Flew on 32 missions with Lt Gravrock - five as Waist Gunner plus one mission (300) with another Pilot. Combat tour completed on 22 March 1945. S/Sgt John C. Elliott (WG) - Flew on 25 missions with Lt Gravrock. Killed in Action on mission 335, 21 January 1945, 1Lt Richard D. Duffield Pilot. Also flew on mission 304 as Togglier with another Pilot. T/Sgt Charles L. Gerstel (WG/TOG) - Original member of the Lt Gravrock crew and was deleted from the crew when only one Waist Gunner was used. Flew no missions with Lt Gravrock. Completed a 35 mission combat tour on 30 March 1945 having flew as Togglier (32 missions), Waist Gunner (2 Missions) and Tail Gunner (1 mission) with 13 different Pilots, 19 missions with the Lt Joe B. Arwood crew. S/Sgt Phillip W. Hensel (TG) - Flew on 23 missions with Lt Gravrock. Killed in action on mission 335, 21 January 1945, 1Lt Richard D. Duffield Pilot - Only mission without Lt Gravrock as Pilot.